Phosphorus is essential for microbial systems because it is a required component for sugar phosphates, RNA, DNA and high energy molecules. Because many of the inorganic salts of phosphate have a low solubility in aquatic environments, phosphorus is commonly a limiting nutrient in natural environments, and bacteria have adjusted to overcome this limitation. The principal mechanism for bacterial acquisition of phosphorus is to use uptake transport systems for inorganic phosphate. Since iron and calcium form insoluble phosphate minerals, bacteria will solubilize phosphate by the production of acidic end products of metabolism. Organic phosphorous compounds in the form of phosphate esters are a product of biological material decaying, and phosphatase enzymes will release inorganic phosphate. There are two major groups of phosphatase enzymes: acid phosphatases and alkaline phosphatases. This classiﬁcation of phosphates reﬂects the pH for optimum activity, and both types can use a variety of organic compounds with phosphate esters as substrates. Generally, organisms in aquatic or soil environments will use alkaline phosphatases, while intracellular organisms growing inside vacuoles of host cells use acidic phosphatase. Additionally, organic molecules containing shown in Figure 10.13. Since inorganic phosphate may be limiting in the environment, many bacteria will store phosphate as a dense granule inside the cell. During periods of adequate levels of phosphate, it accumulates inside the cell as a polyphosphate granule, and when extracellular phosphate becomes limiting the polyphosphate reserve is utilized. For cultivation of microorganisms in the laboratory, phosphate is commonly used as a buffer; however, in nature carbonate, and not phosphate, functions to maintain the pH within the tolerance levels for growth. There is a sensitive regulatory process that controls the production of different enzymes for phosphate utilization, and this is an important feature for bacterial persistence in the environment. When inorganic phosphorus may have a direct C–P bond; these molecules represent the phosphonates. Phosphonates are relatively common in nature, and inorganic phosphate may be released following the action of either a phosphonase or a C–P lyase (Wanner 1994). Bacterial utilization of phosphate and phosphonate are summarized in the reactions phosphate is available in adequate levels to support the growth of bacteria, inorganic phosphate is transported into the cell by a low-afﬁnity transport system with the repression of acid or alkaline phosphatase and phosphonase or a lyase. If inorganic phosphate is limiting, bacteria will produce appropriate enzymes for release of inorganic phosphate from phosphate esters or from phosphonates. Phytic acid−(phytase) →inositol+6H 3PO4 Phytase is an extracellular enzyme produced by several strains of bacteria and fungi found in soil environments as well as in stomachs of ruminants (cows, sheep, etc.). Monogastric animals such as humans, pigs, and chickens do not have the appropriate microbial ﬂora to produce phytase, so phytic acid is not decomposed in the animal but is released with the intestinal waste (Wodzinski and Ullan 1996). Phytic acid is readily metabolized by microorganisms in the soil or in aquatic environments. Phosphorus is only second to nitrogen as a mineral nutrient required for plants, animals and microorganisms. It is a major constituent of nucleic acids in all living systems essential in the accumulation and release of energy during cellular metabolism. This element is added to the soil in the form of chemical fertilizers, or in the form of organic phosphates present in plant and animal residues. In cultivated soils it is present in abundance (i.e. 1100 kg/ha), but most of which is not available to plants, only 15 % of total soil phosphorus is in available form. Both inorganic and organic phosphates exist in soil and occupy a critical position both in plant growth and in the biology of soil. Microorganisms are known to bring a number of transformations of phosphorus, these include: (i) Altering the solubility of inorganic compounds of phosphorus, (ii) Mineralization of organic phosphate compounds into inorganic phosphates, (iii) Conversion of inorganic, available anion into cell components i.e. an immobilization process and (iv) Oxidation or reduction of inorganic phosphorus compounds. 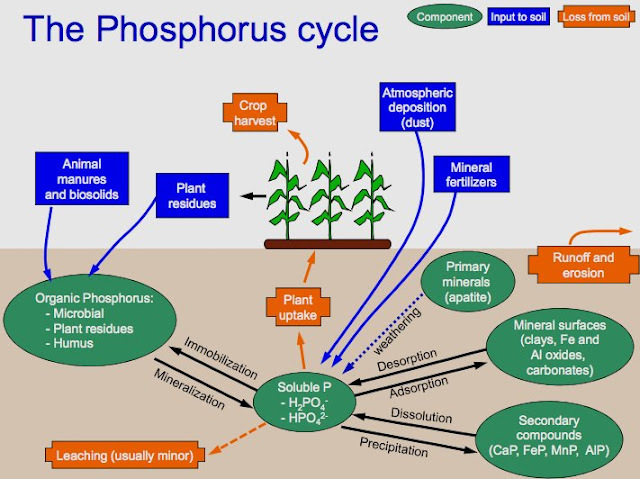 Of these mineralization and immobilization are the most important reactions / processes in phosphorus cycle. Insoluble inorganic compounds of phosphorus are unavailable to plants, but many microorganisms can bring the phosphate into solution. Soil phosphates are rendered available either by plant roots or by soil microorganisms through secretion of organic acids (eg. lactic, acetic, formic, fumaric, succinic acids etc). Thus, phosphate-dissolving / solubilizing soil microorganisms (eg. species of Pseudomonas, Bacillus, Micrococcus, Mycobacterium, Flavobacterium, Penicillium, Aspergillus, Fusarium etc.) plays important role in correcting phosphorus deficiency of crop plants. They may also release soluble inorganic phosphate (H2PO4), into the soil through decomposition of phosphate-rich organic compounds. Solubilization of phosphate by plant roots and soil microorganisms is substantially influenced by various soil factors, such as PH, moisture and aeration. In neutral or alkaline soils solubilization of phosphate is more as compared to acidic soils. Many phosphates solubilizing microorganisms are found in close proximity of root surfaces and may appreciably enhance phosphate assimilation by higher plants. By their action, fungi bacteria and actinomycetes make available the organically bound phosphorus in soil and organic matter and the process is known as mineralization. On the other hand, certain microorganisms especially bacteria assimilate soluble phosphate and use for cell synthesis and on the death of bacteria, the phosphate is made available to plants. A fraction of phosphate is also lost in soil due to leaching. One of the ways to correct the deficiency of phosphorus in plants is to inoculate seed or soil with commercial preparations (eg. Phosphobacterin) containing phosphate - solubilizing microorganisms along with phosphatic fertilizers. Mineralization of phosphate is generally rapid and more in virgin soils than cultivated land. Mineralization is favored by high temperatures (thermophilic range) and more in acidic to neutral soils with high organic phosphorus content. The enzyme involved in mineralization (cleavage) of phosphate from organic phosphorus compound is collectively called as“Phosphatases".